This post took me a while to finalize. It's not for a lack of trying - I sat down many times in the last few months to finish sorting through photos and write this post - but it was so hard to choose the words and photos that sum up our trip. 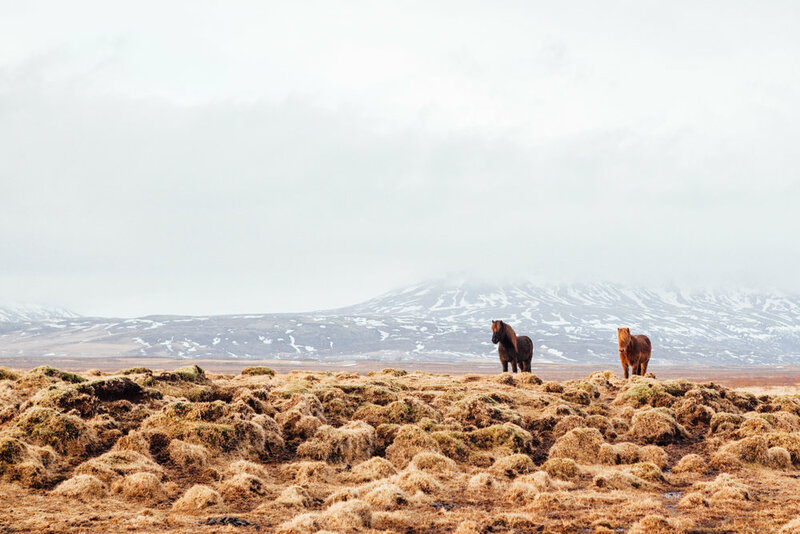 To keep it short and sweet: Iceland is stunningly beautiful. Book a flight. 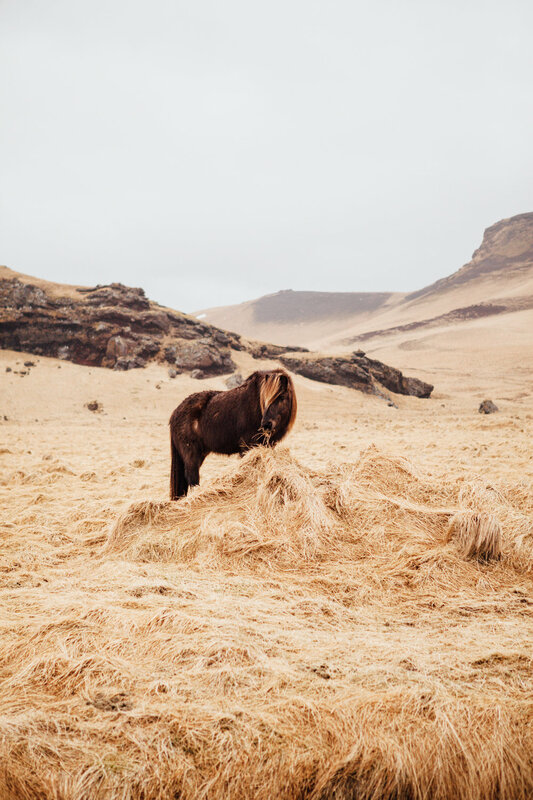 Below are some (I really did try to narrow this down) of my favorite images from our 4-day trip along Iceland's Southern Coast and the Golden Circle. I've included extended captions on this post to help anyone who is planning a trip in the future. I can't express how helpful it was to get recommendations from friends who have gone before us to help plan out our days - special thanks to Carolyn, Dan, Amanda and Mandy! Photos shot on a Fujifilm x-T1, Canon 5dMkii and iPhone 7+. P.S. If you can make it to the bottom of my post, I shared our Google Map that has most of the locations and other points of interest flagged. This was our lifeline while we were there! A quick establishing shot to show off our trusty rental car during our first afternoon. We are about 20 minutes outside of Reykjavik here. 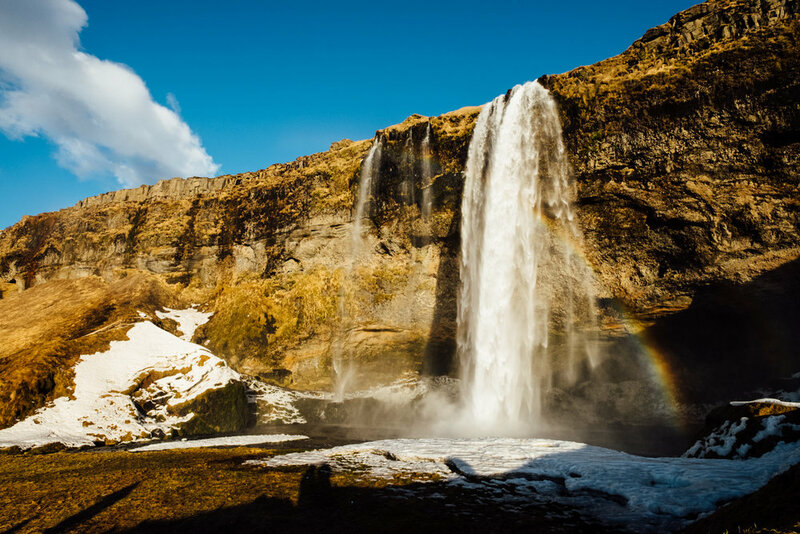 Our first stop was the Seljalandsfoss waterfall. We arrived here right as the sun was setting, so the light couldn’t have been more beautiful - a huge change from the cloudy weather that greeted us when our plane landed just a few hours prior. This waterfall is popular due to its accessibility, and during the summer months you can walk behind it (unfortunately that walkway was closed when we were there). The stairs leading up to the waterfall. We were so lucky to experience some sunshine on our first day in Iceland. It’s pretty rare all year round, but especially in winter. Looking out towards Ring Road from on our walk from Seljalandsfoss to the nearby Gljufrabui waterfall. Walking to Gljufrabui - less than half a mile down the path from Seljalandsfoss. Jake posing in front of Gljufrabui! 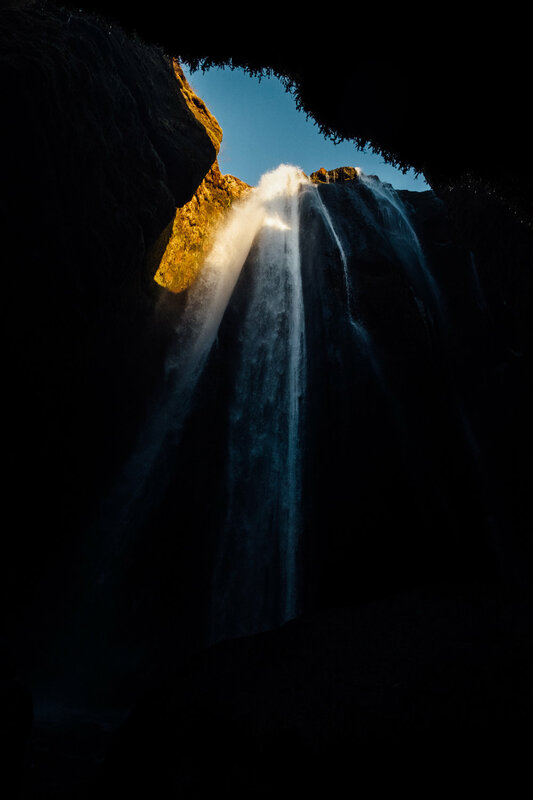 This was one of our favorite hidden gems in Iceland - this waterfall is tucked behind a rock face and not visible from the front. It’s an easy hike through a shallow stream to get into the clearing to view the waterfall - totally worth it! Be sure to wear waterproof clothing if you want pics, though, you’ll definitely get soaked. Looking up at Gljufrabui from inside the cavern. Looking out towards Ring Road from Gljufrabui. This is the entrance to the waterfall. A beautiful rainbow over the road on our way to the next waterfall. 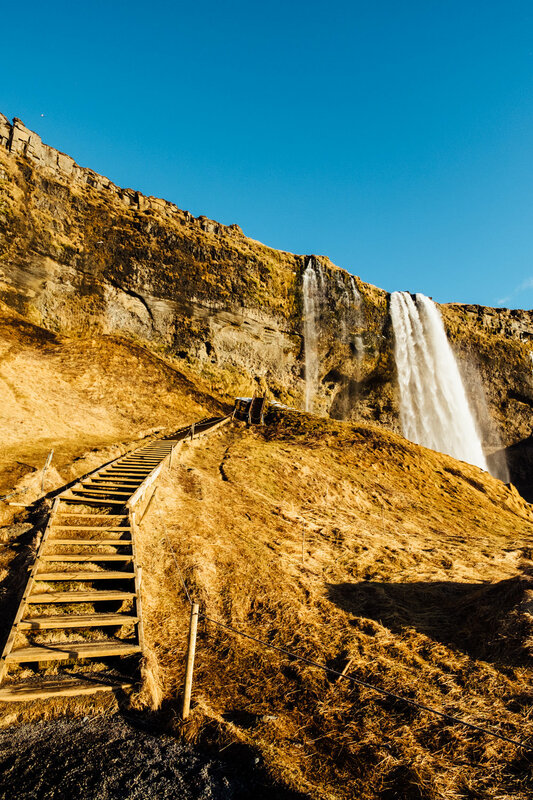 Next stop: Skogafoss! This waterfall is about 200 feet high and also easily accessible from Ring Road. Sadly we got here right after the sun set, so we didn’t get too much time to check it out before it got dark. Looking back at Hjörleifshöfði from the beach. Hjörleifshöfði is a promontory (sort of a small mountain that emerges from the ocean) that is apparently haunted. 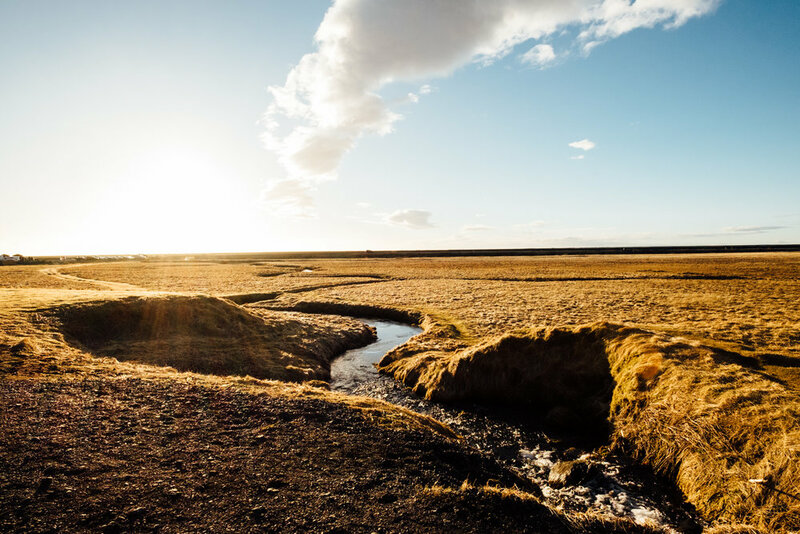 It is named after one of Iceland’s ancient viking settlers (Hjörleifr Hróðmarsson) - there is a burial mound, family plot and, at one point, ruins of a family farm at the peak. Looking towards the peak of Hjörleifshöfði. 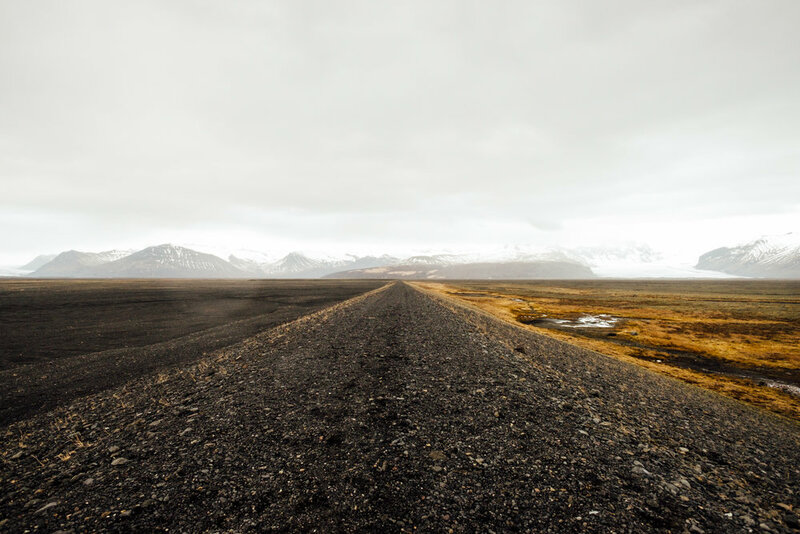 One of the best things about driving through Iceland is how dramatically the landscape can change in a matter of minutes. 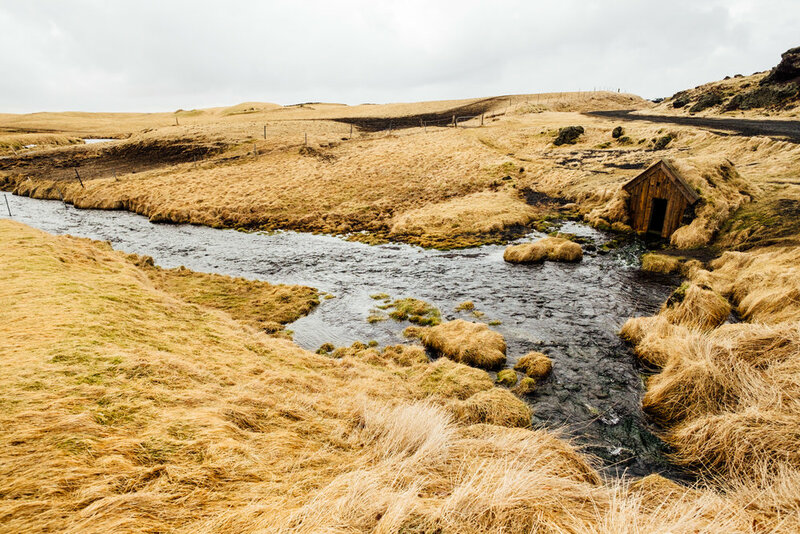 From rolling mossy lava fields to huge mountains, glaciers, and waterfalls, something unexpected is around every turn. We didn’t see anything about this when we were researching, so we were so thrilled to stumble upon it! 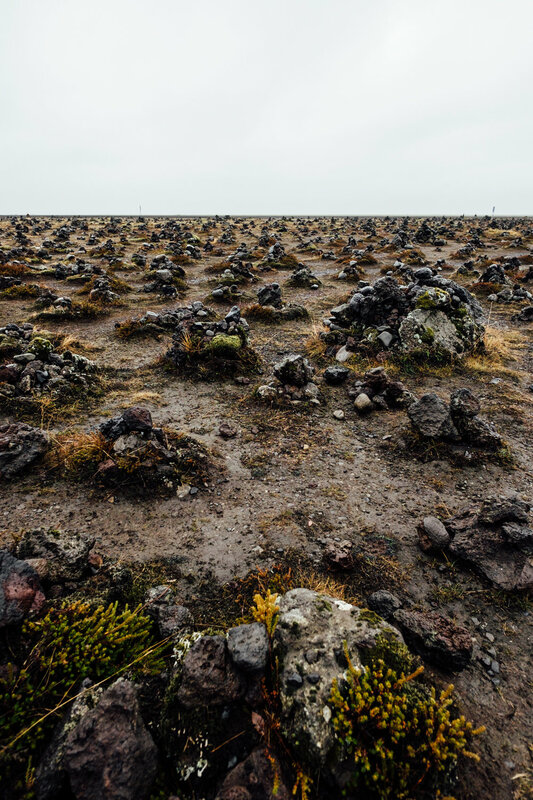 These are the cairns at Laufskálavarða, a lava ridge between the Hólmsá and Skálmá Rivers. 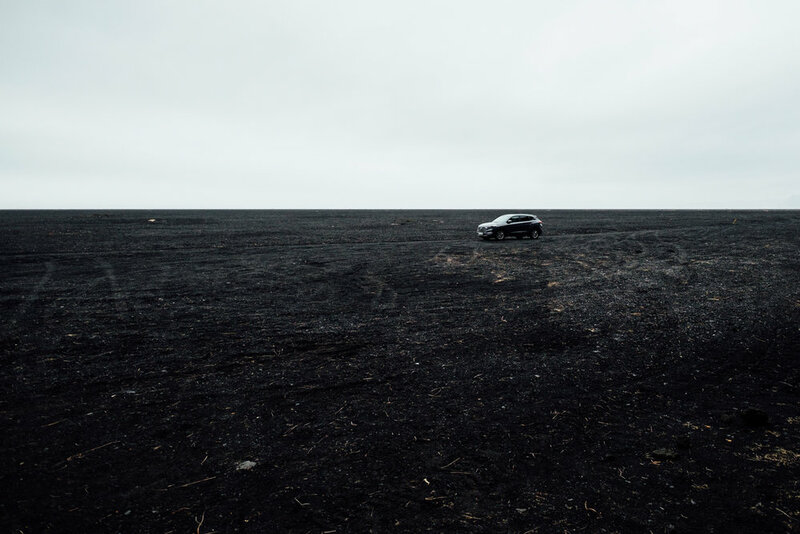 This lava mound is said to have been created after the destruction of the Laufskalar farm after the eruption of Katla - Iceland’s most dangerous volcano that is due to erupt again any day now - in 894. It was tradition for travelers passing through this area to add a stone to the cairns for good luck. Disturbing the landscape to build more cairns is frowned upon now, but it’s still astonishing to see the hundreds of little rock sculptures all around you. 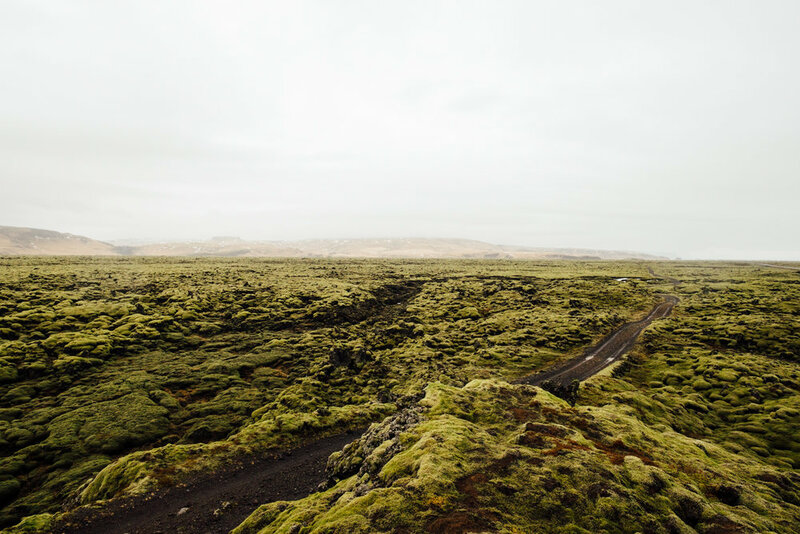 Looking out at the mossy lava fields during our drive east on day 2. Another photo from a roadside stop. This is a road that was blocked off heading inland towards a glacier. 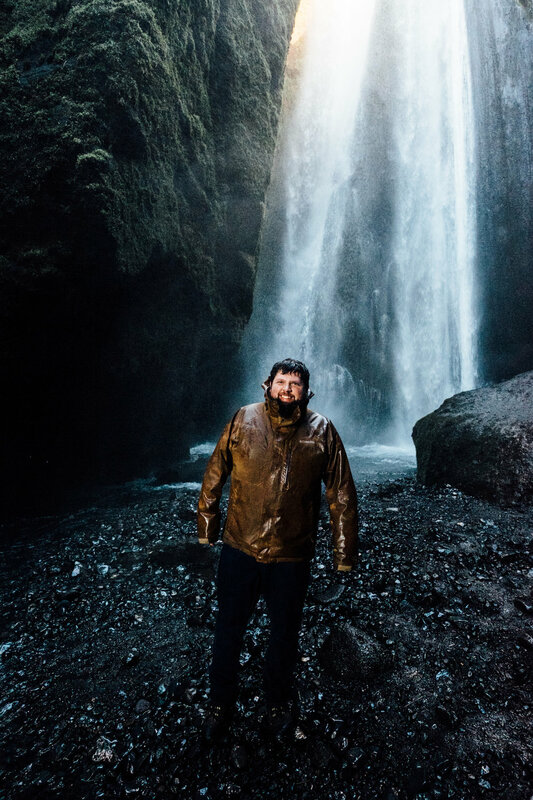 Our first big plan for day 2 was to see the Svartifoss waterfall, but the road to get to it was closed, and the hike was too lengthy for our schedule. Instead, we did the quicker hike to the Skaftafellsjökull glacial tongue nearby! Skaftafellsjökull comes off of Vatnajökull, Iceland’s largest Ice cap. Our first look at Skaftafellsjökull. It’s hard to put in perspective how large these glaciers are. 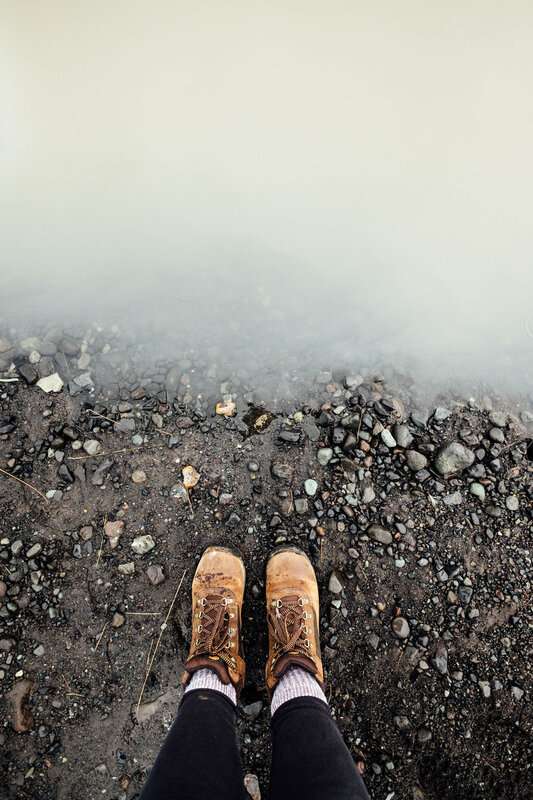 Obsessed with the cloudy glacial waters and volcanic earth. You’ll notice a trend of Jake walking ahead without me in many of my photos - life with a photographer girlfriend, I guess! We’re still wandering Skaftafellsjökull here. Next stop: Svinafellsjökull. 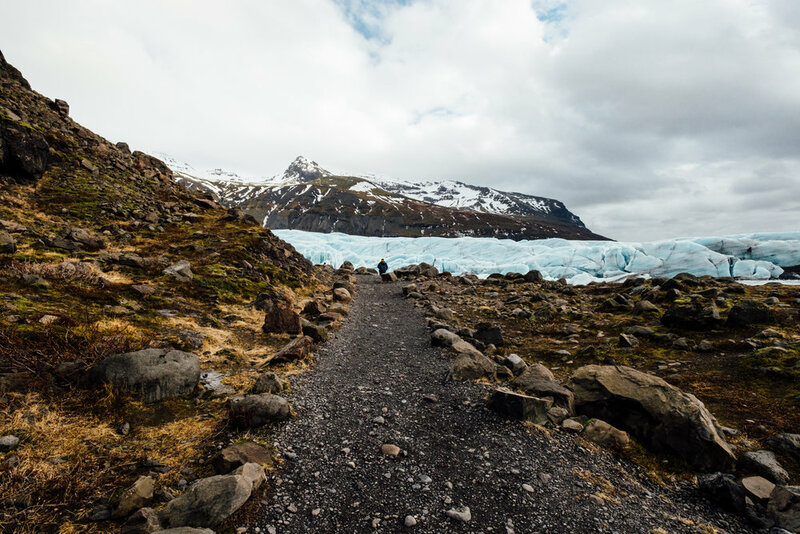 We also didn’t have this glacier on our plans, but Jake saw that the road to it was for 4-wheel drive vehicles only, so we couldn’t resist. This one was great to check out because you were above the glacier looking down, which was a perspective we didn’t get to see at any other point on the trip. Enjoying the views at Svinafellsjökull with a few other tourists. While it was a bit cold in March, we are so glad we went before summer, because the landmarks weren’t nearly as crowded as we expected. There were many times on the trip that we were the only ones at a certain spot. The view towards the ocean from Svinafellsjökull. The afternoon of day 2 turned out to be our favorite part of the trip. After a long drive, we made it to Diamond Beach - one of my most anticipated parts of our journey. We have a photo in our living room of this beach that my brother took during his visit to Iceland, so we needed to see it for ourselves! Diamond beach did not disappoint. 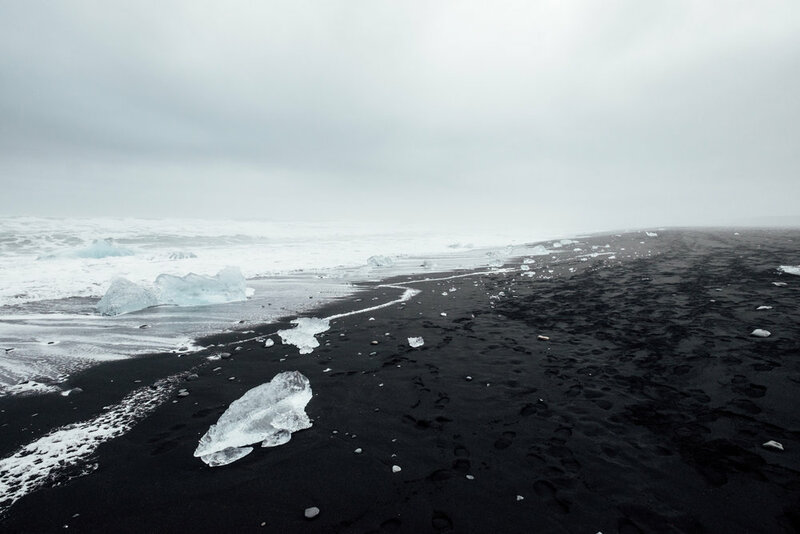 The beach gets its namesake from the large chunks ice that get stranded on the beach while drifting out towards the ocean from the Jokulsarlon Glacier Lagoon (we did that next). Jake walking away into the mist looking for good photo ops. 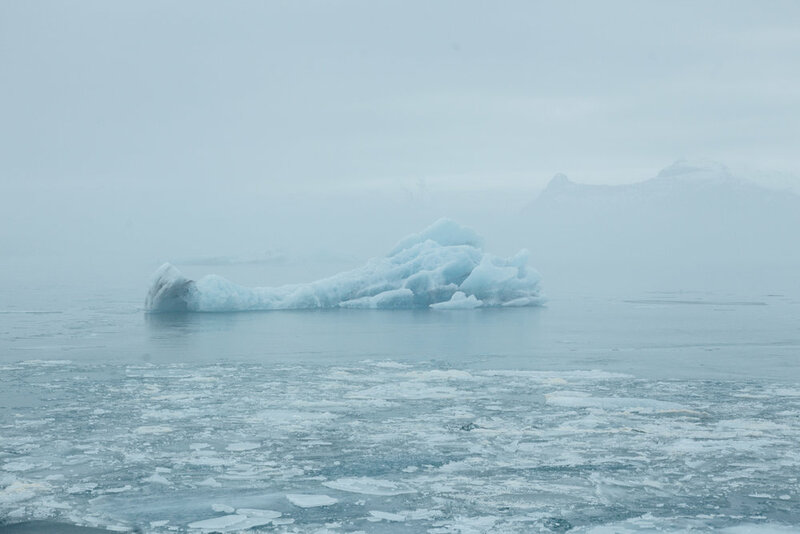 This is our first image from Jökulsárlón (glacier lagoon). 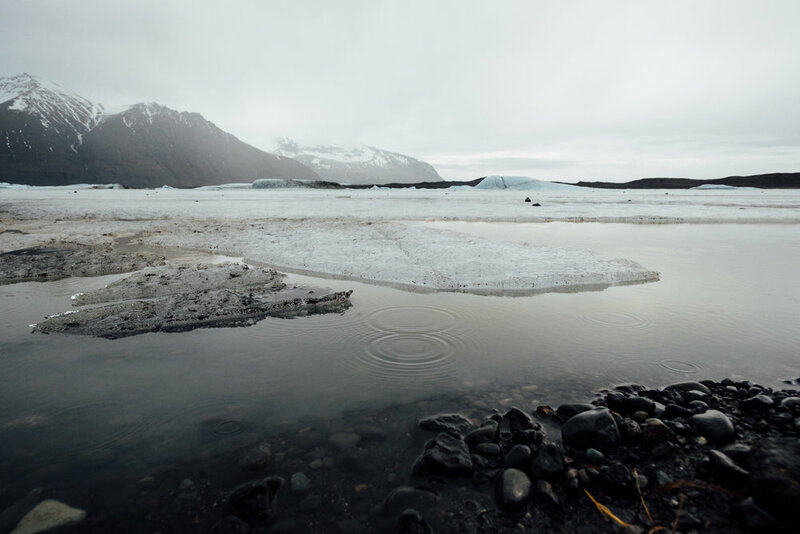 The lagoon drains into the Atlantic and contains icebergs and water from the surrounding Breiðamerkurjökull glacier. 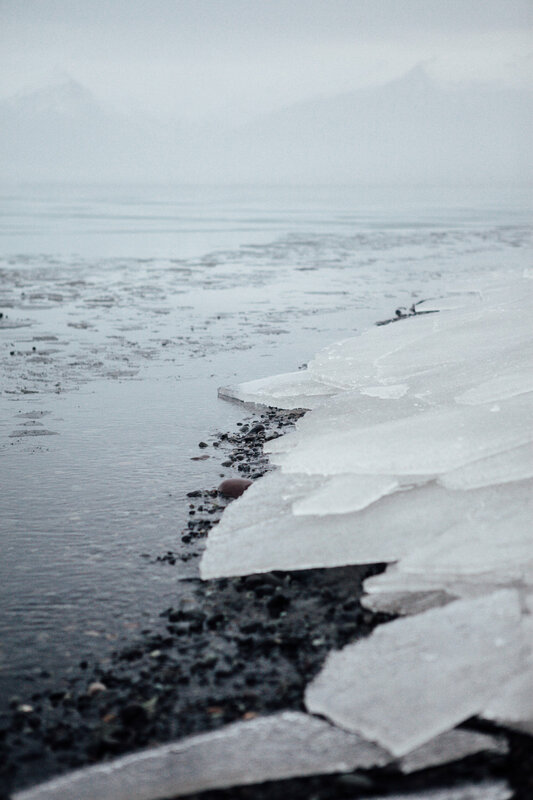 The blue glacial water and overcast skies made for a surreal experience here. The lagoon appears incredibly still, but the water actually moves pretty quickly. There is also a large concentration of Iceland’s wildlife in the lagoon (including seals!). A female Common Eider drifting along in the freezing cold lagoon. Sheets of ice that drifted on shore from the lagoon at Jökulsárlón. The clouds drifted away long enough to get a better look at the mountains while we were at Jökulsárlón. A view from the other side of the lagoon. Again, hard to put the size of the icebergs and glaciers into perspective. Day 3! Our hotel (Icelandair Hotel Vik) was just beneath the famous church in Vik. It’s situated on top of a hill overlooking the village. 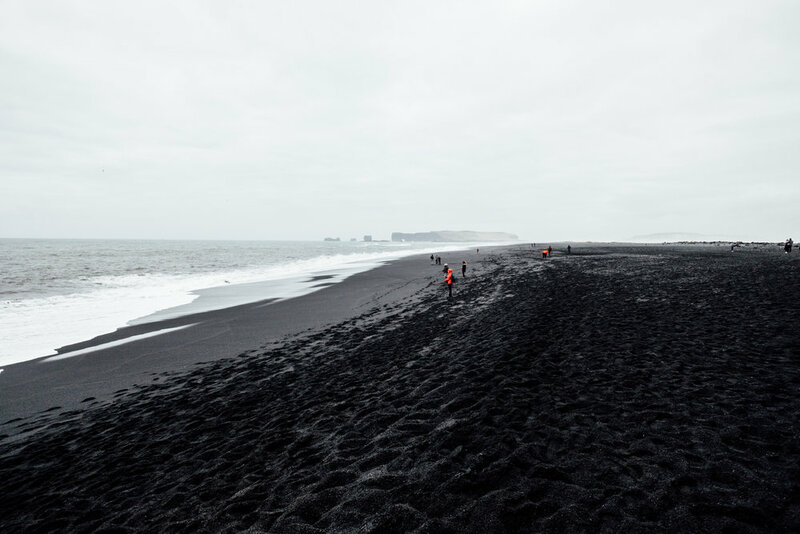 Our first stop on day 2: Reynisfjara Black Sand Beach in Vik. 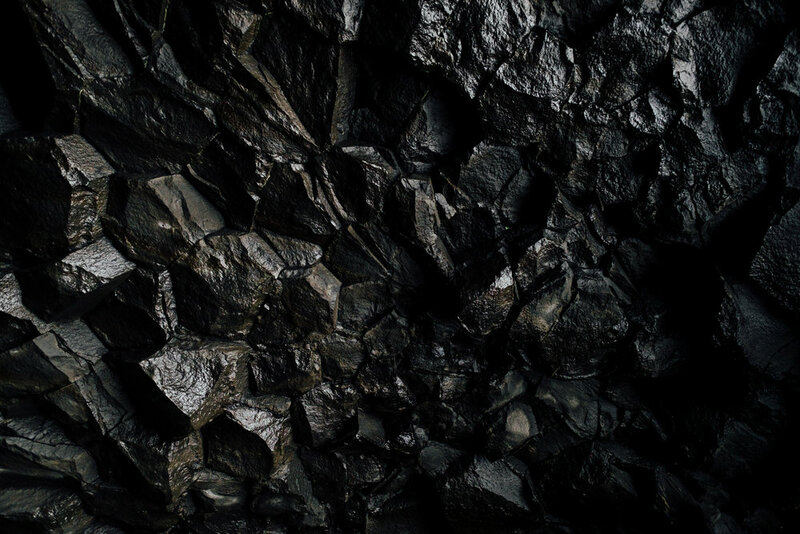 These basalt columns are so hexagonal and perfect, it’s hard to believe they were created naturally. 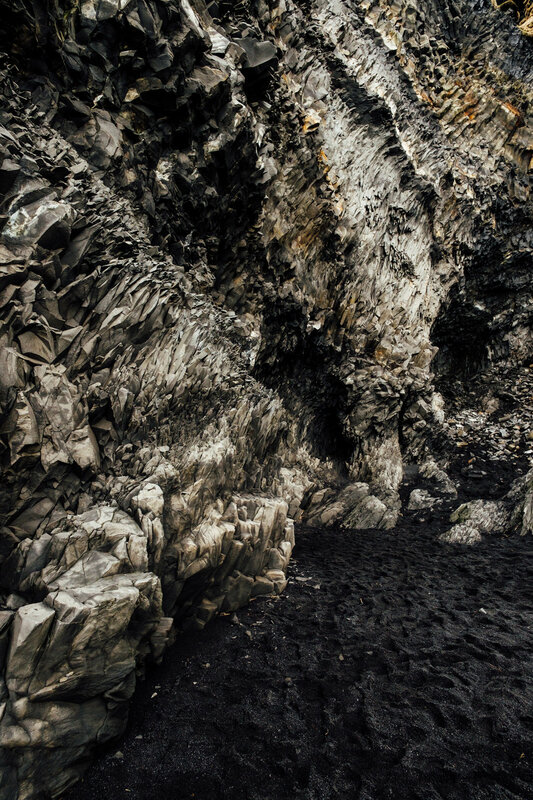 A better view of the basalt columns at Reynisfjara. The columns are formed by fractures from slow-cooling lava. Looking out at the black sand beach. 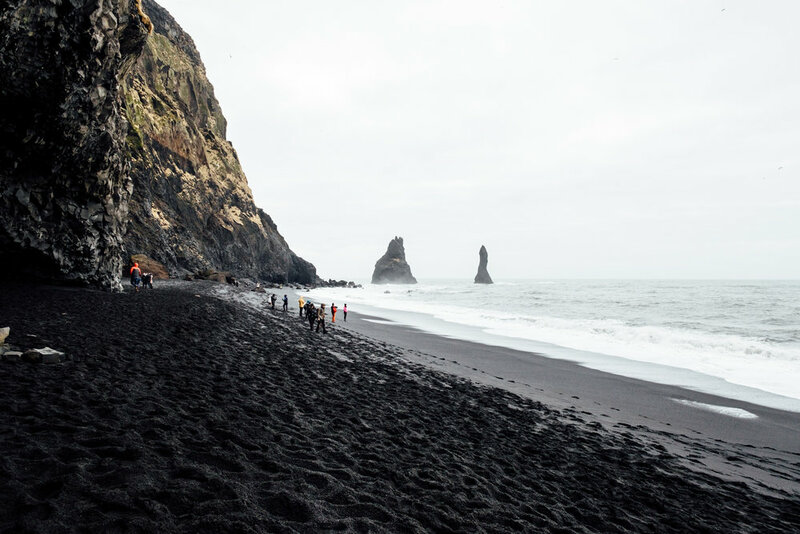 The sand here is such a intense deep black - it’s hard to describe without seeing it in person. Showing the scale of the columns. Photo by Jake. Looking Eastward down the beach towards Reynisdrangar, large rock formations just off the shore in Vik. These rocks are home to a ton of birds, including Puffins in the summer! 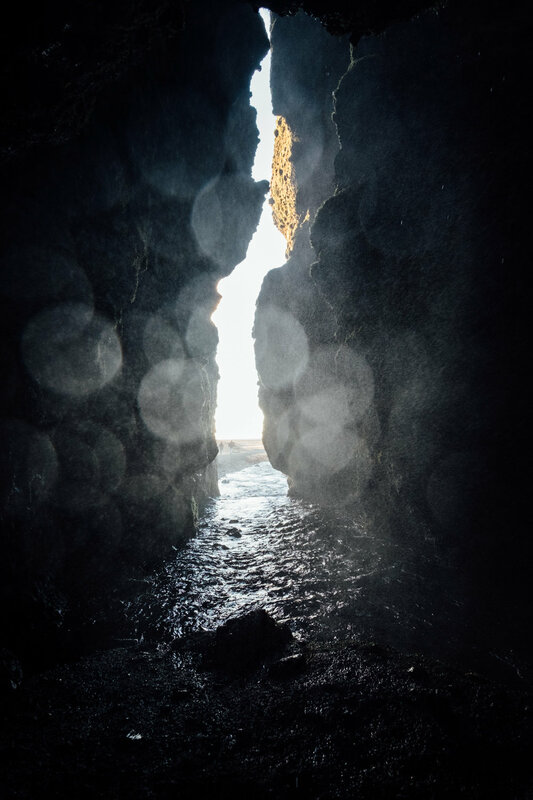 Inside the basalt cave at Reynisfjara. A moody phone shot of the black sand beach in Vik. 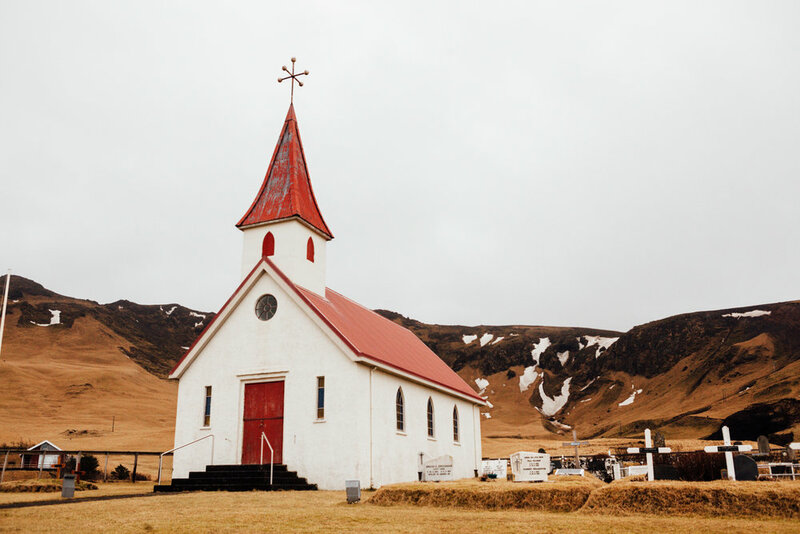 Another beautiful Icelandic church. 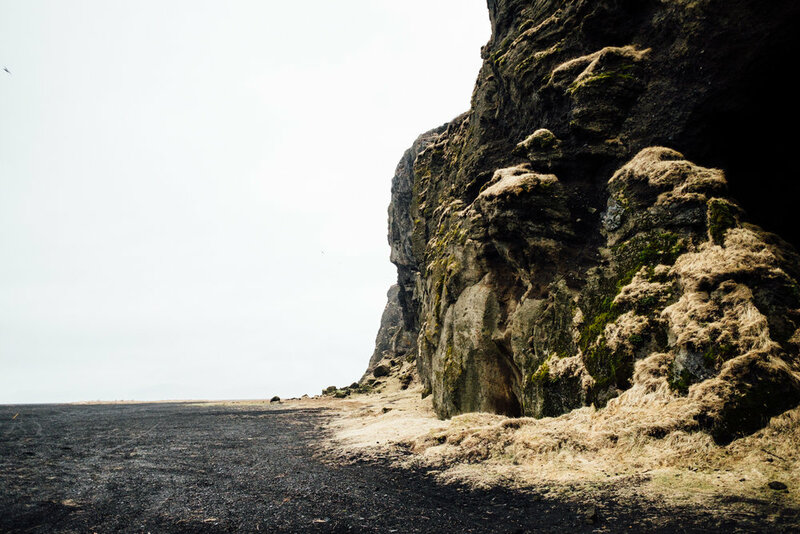 This one is on the road that leads from Reynisfjara back to the main road. 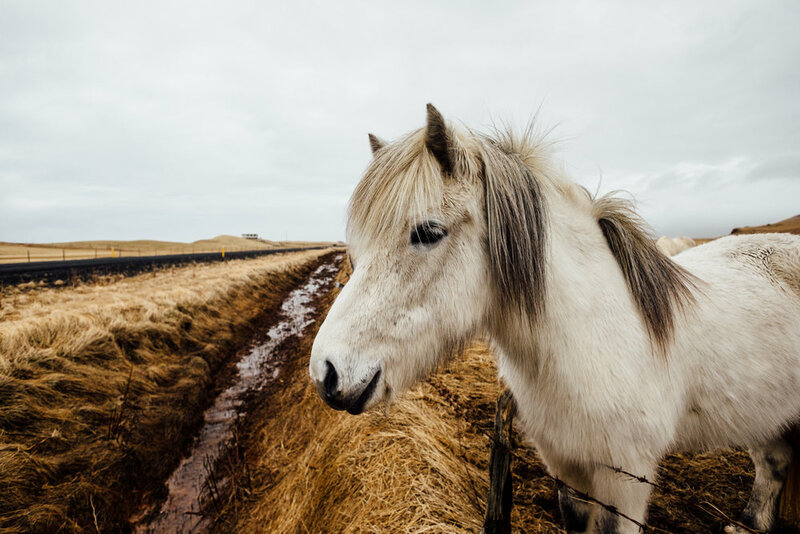 We saw a ton of Icelandic ponies, but many were too far from the road for photo ops. After this one we saw (and said hi to) a ton. Jake forced me to drive up a terrifying corkscrew hill for this view. It was worth it. This is the overlook near the Dyrhólaey Lighthouse (we’re looking Westward here - the Dyrhólaey Peninsula and famous arch is behind us). Looking West down the beach. One of my favorite views of the trip - looking back inland from the Dyrhólaey Peninsula. It’s hard to see in photos, but there are thousands of these birds on every sea cliff in Iceland. This bird is a Northern Fulmar: they are well-known for throwing up stomach oils at intruders as a defense. Gross! Waves crashing along the shore. We are just about at the Southernmost point in Iceland here. 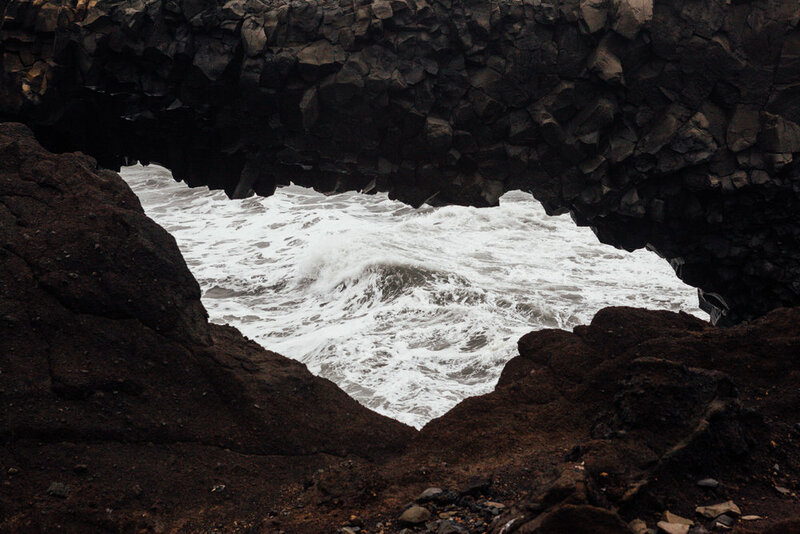 Looking through the Dyrhólaey arch at the waves. A distance view of Reynisdrangar from the Dyrhólaey Peninsula. After Dyrhólaey, we headed to do a quick day trip around the Golden Circle. One our drive we were greeted by another pony looking for pets and food at the roadside. A quick stop to check out the Solheimajokull Glacier just outside of Vik. This glacier is also receding at an alarming rate due to climate change. Stop one on the Golden Circle was the Keldur Turf Houses. This is the beautiful spring house at the entrance to the village. Looking down the stream from the spring house. Quick shot of one of the beautiful Keldur Turf Houses. The original structures are very old, but the homes were rebuilt in about 1912 after an earthquake shook the houses. We were happy to have enough time to catch some erupting geysers during our quick stop at Geysir on the Golden Circle. Geysir is one of the first recorded geysers in history (and where the term got it’s namesake). Geysir is currently inactive, but a nearby geyser was erupting every few minutes! We got to see it go offer two or three times before heading to our next stop. Our next stop was Gullfoss. Gullfoss is a huge waterfall (or convergence of a couple waterfalls, really) located in the canyon of Hvítá River. 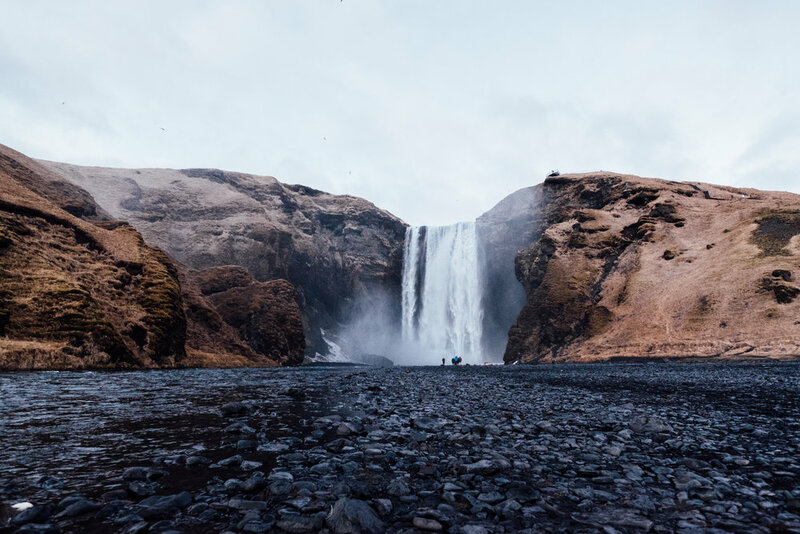 This is one of Iceland’s most popular landmarks, so it was crazy crowded. Still a great stop, although we would have needed more time to really see it in its entirety. Had to finish the photo series with a pony shot, of course! 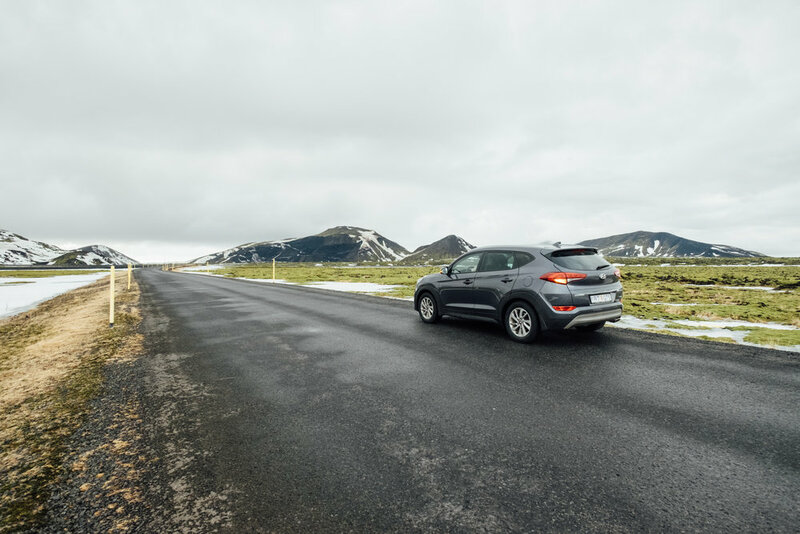 This was taken on the way to our last stop on the Golden Circle, (the Kerid Crater - which didn’t make for great photos) before we headed to our Reykjavik hotel to crash before flying out the next morning.